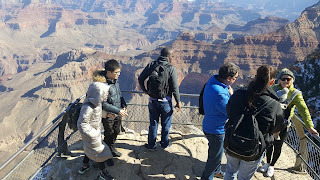 7:26 am - Wednesday - January 31st - Grand Canyon - 28º F, 53% humidity, wind 2 mph out of the south by southwest.......forecast high for today is 60º F with mostly sunny skies.....WOW, here we are at the last day of January already....wasn't it just New Year's day? 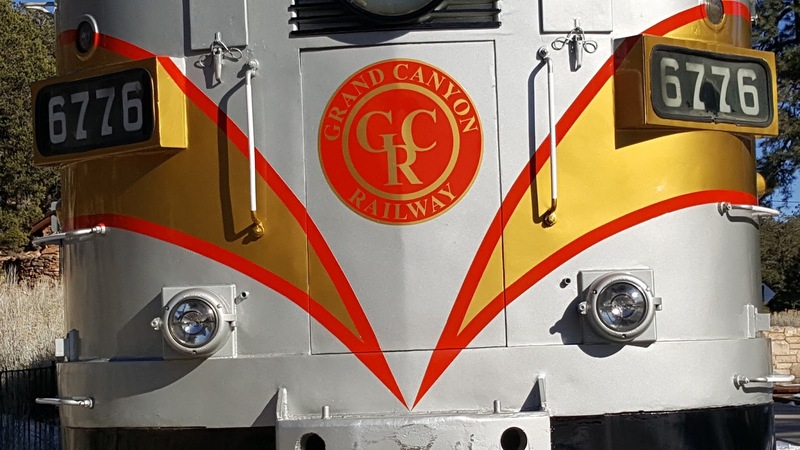 We have just 46 days left in our tenure here at the Grand Canyon.....life is moving pretty fast! Tuesday was our 'Friday'.......we're back to being off work Wednesday's and Thursday's, which we love. I didn't have my first customer at the cash register until almost 11 am, and ended up depositing just $35 in cash for my 5 hour shift. On the other hand TLE deposited over $400, so you just never know how a day is going turn out this time of year. Our weather continues to get warmer with temps edging into the 60's as was forecast. I heard Phoenix set a temperature record for January 29th with a high in the 80's. 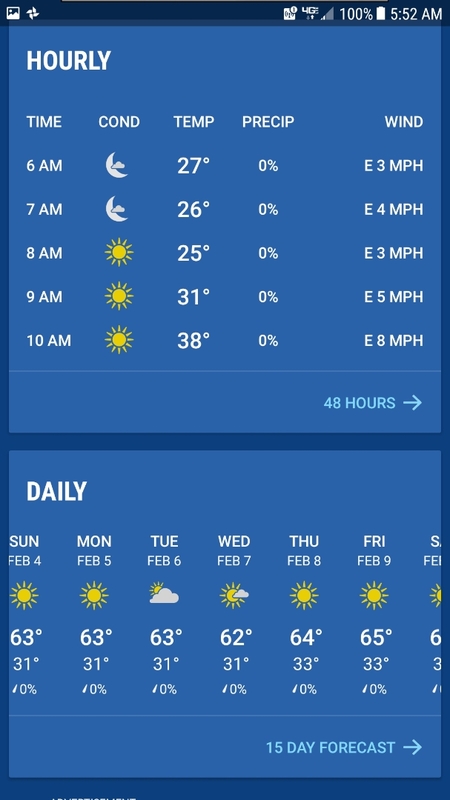 We're apparently under a high pressure ridge right now, which is responsible for the higher temperatures. 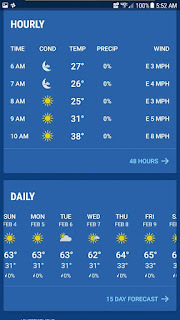 Whatever the reason it is nice to walk outside in a t-shirt and not worry about a jacket. With the rise in temperatures the packed snow and ice that was on the road between us and the Village has finally melted. 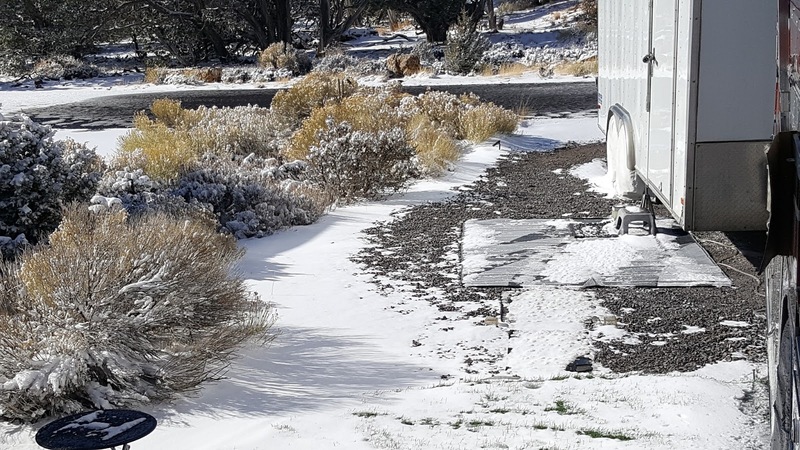 We still have some snow on our site from the last storm on the 20th. I had to drive over to the Village for the second day in a row because I discovered an error in my blood pressure medication.....the pharmacy had issued me 30 mg pills instead of the 20 mg I had been taking the first month. Apparently the nurse made a typographical error when entering my medications in their computer. The drive over can be done in 30 minutes if there is no traffic. The speed limit (with a few exceptions) is 45 mph in Grand Canyon National Park just like Yellowstone. Unfortunately there is always at least one driver who drives 30-35 mph, and there are only a few places where you can pass. There are plenty of places for slow drivers to pull over and let faster moving traffic pass, but the slow drivers rarely, if ever, avail themselves of these opportunities. When you are just trying to get from point A to point B and have already seen all the sites it gets a little frustrating to get stuck behind a 'slowby'. I left Desert View just before 1 pm and was back just before 3 pm, at which time I changed into my riding/workout clothes and went out to do another 30 minutes on the stationary bicycle. Every time I work out I lose 1/2 pound.....now to get consistent once again and lose that last few pounds. TLE chose to walk home from work Tuesday and she arrived just before 5:35 pm. 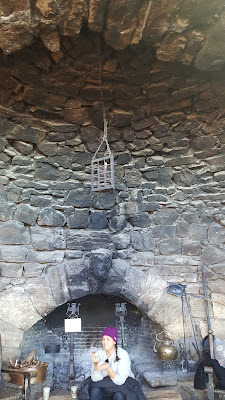 We had planned to sit outside by the fire for about an hour, but the wind came up about 4 pm putting the kibosh on that idea. We live in a very dry environment and having a fire with wind is not a very good idea. We watched a couple of recorded programs on TV before hitting the sack just before 10 pm.....we're off to Prescott, AZ on Wednesday for a couple of days.....there is a COSTCO and Trader Joe's there so you know we will be dropping some money at those establishments before we return to Desert View on Thursday. When you shop Amazon, please use our link (below) to access their website.......we will appreciate every purchase you make using our Amazon Affiliate link, and remember, using our link will not add one penny to your purchase, plus we will receive a small commission. 5:53 am - Tuesday - January 30th - Grand Canyon - 29º F, 49% humidity, wind 1 mph out of the south......partly cloudy skies today with a forecast high of 59º F.
Monday, Monday, so good to me (Mamas and Papas)......and that is all the lyric that really applies to this blog post about Monday. Monday began slowly, continued to be slow and ended slowly. I think between TLE and I we deposited less than $200 cash for the entire day. That's not a bad thing for us.....it's nice to have a very, very slow day once and a while. Most of our days the past month have been pretty generic, and there is not much to write about lately. My lengthiest blog posts are about our days off work when we are actually doing something different, or interesting so I guess it's only natural that we wish we had more off days. However, it is what it is, and so we meander on day by day. Life isn't always exciting, and we aren't on vacation.....we're just living our lives day by day as vagabonds. Being a vagabond is a lot like living in a 'sticks and bricks' home, except for the fact that we change our view on a regular basis.....we just don't live in the same place for years at a time. Sometimes we spend 4-5 months in one place...sometimes just a few days, or weeks. And that is probably why some of you read our blog to find out what our version of living the vagabond life looks like. No two of us do it exactly the same. Monday morning a female customer approached me to ask questions about my job, how I got it, and how I like it. The conversation evolved into one about living in an RV full time, and moving from job to job. She is near retirement and is seriously considering selling her home and moving about the country in an RV. The longer we talked the more excited she became. As I reflect back on our time here I realize how often that conversation has happened. I would say I am approached at least once, or twice a week at a minimum by people interested in our lifestyle, and seasonal jobs. They are often surprised to find out that there is a whole sub culture of people who have chosen the vagabond life, and are moving about the country living their lives more deliberately and simply. TLE arrived just before 12 pm as she always does.....she is really, really enjoying being able to sleep in every single day, not just on our 'weekend'. I'm enjoying being home before 1 pm every day. She likes having time in the morning to prepare special dinners, to read, and just relax before she goes to work. 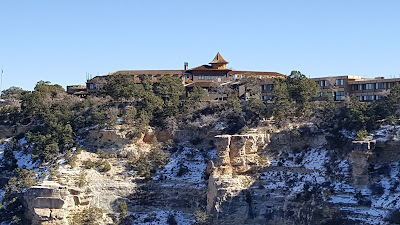 On this particular Monday I had another doctor's appointment over at the Grand Canyon Clinic. This was a followup visit to check on my progress under my medication regime. I have been keeping a record of my daily blood pressure readings for the past month, which he asked to review. He was immediately impressed with my readings, and recommended no changes. In fact, he said I would not need to return for 90 days.....well, I won't be here in 90 days and related to him that we are working a seasonal job. He reminded me again that I basically won the lottery with such a minor stroke, and no after effects......many are not so lucky. His office personnel will prepare copies of my records to transfer to my doctor in SoCal. After my appointment I refilled my monthly prescription and headed over to the Marketplace to pick up a few necessities (vino, peanut butter, raisins, vodka, grapes, cheese, etc.) before heading back to Desert View. I was home a little after 4 pm. So, here I am 5 weeks post stroke feeling really good with ALL symptoms gone like the wind. It could have been so much worse, and every single day I thank God that it was not worse. Our lives could have changed dramatically that day, but it ended up just being a minor 'bump in the road'.....a wake up call, if you will. Since I had the VW I drove over to the store a little after 5 pm to bring TLE home.....life is good! 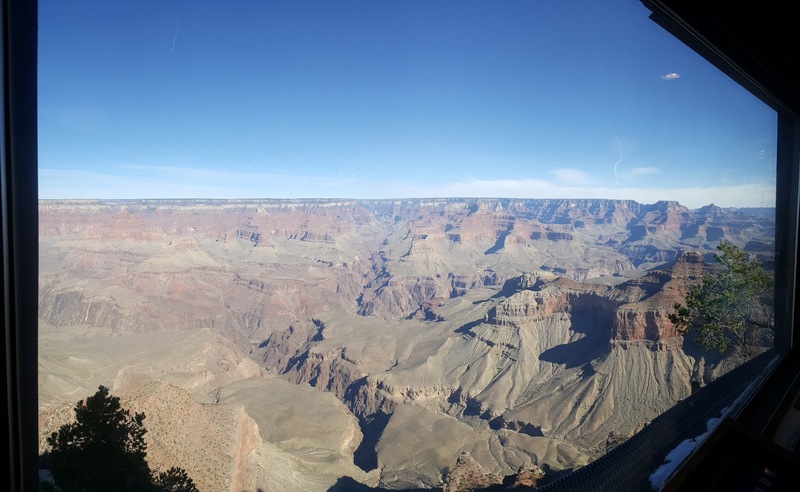 5:47 am - Monday - January 29th - Grand Canyon - 39º F, 38% humidity, wind 9 mph out of the east by southeast (feels CALM).....forecast is for sunny skies with a high of 57º F.....BP 128/84. 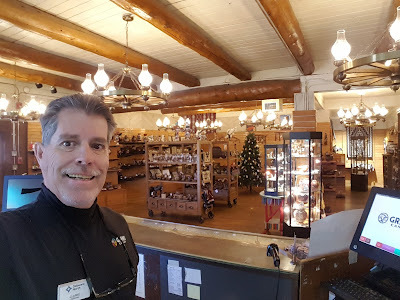 Sunday morning in the General Store was a typical post holidays morning.....I didn't have my first customer until 9:45 am. 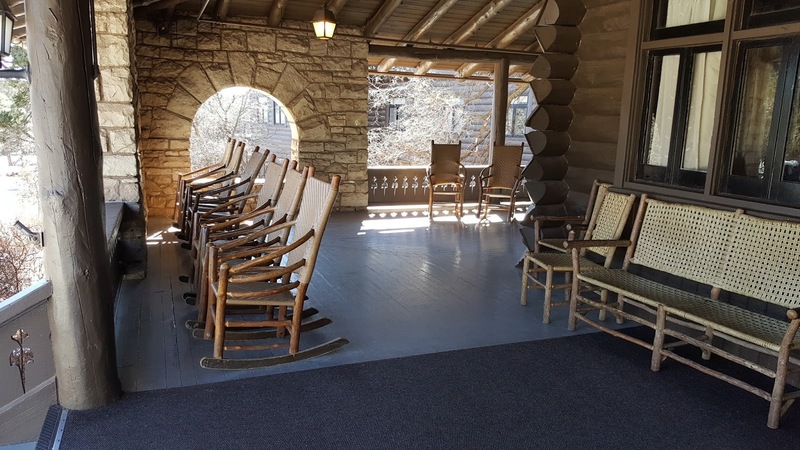 I spent most of the morning dusting, cleaning glass, straightening t-shirts, mopping, checking date codes on perishable items, fronting, cleaning the picnic tables outside the front doors, sweeping the front sidewalks....you know, busy work. I have only ridden my stationary bike one time since I had my stroke.....shortly after that I got sick, and have not really felt ready to ride it again until Sunday. Finally, around 3 pm I got dressed in my workout clothes and went out to ride the bike......it really felt good to get on the bike and just spin for 30 minutes. As I spun, I watched Super Bowl highlights from past Super Bowls on my trailer TV, which made the time pass quickly. Once again TLE was home just before 5:30.....I hear the door on the VW shut as she exits the car and I walk to the door to greet her......I see her round the back of the trailer and smile that wonderful smile.......we hug, and exchange "I love you's"......life is good, and we wouldn't have it any other way. 5:48 am - Sunday - January 28th - Grand Canyon - 27º F, humidity 43%, wind 3 mph out of the southeast.....forecast for today is sunny skies with a high of 54º F. Over the next two weeks we will have 12 days in the 60's, and some nights with lows only in the 30's! I keep joking about how winter will never arrive here for more than a day, or two, and it looks like that may be prophetic......in a few days we will be in February and still no real substantial winter weather. 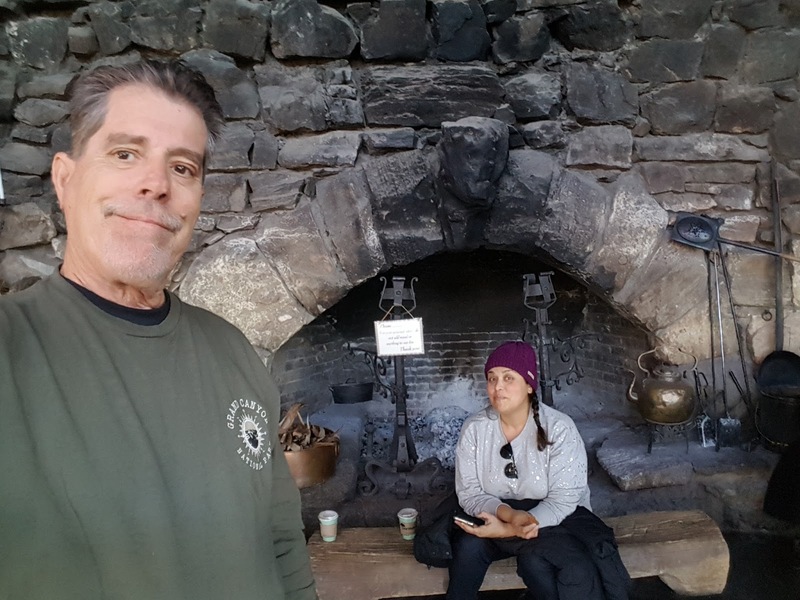 After two days of touring the Grand Canyon with our daughter we were both tired and get this......ready to go back to work. From this point on I have nothing but 'open' shifts meaning I will be off around 12:30 pm every day. TLE will have all 'close' shifts. 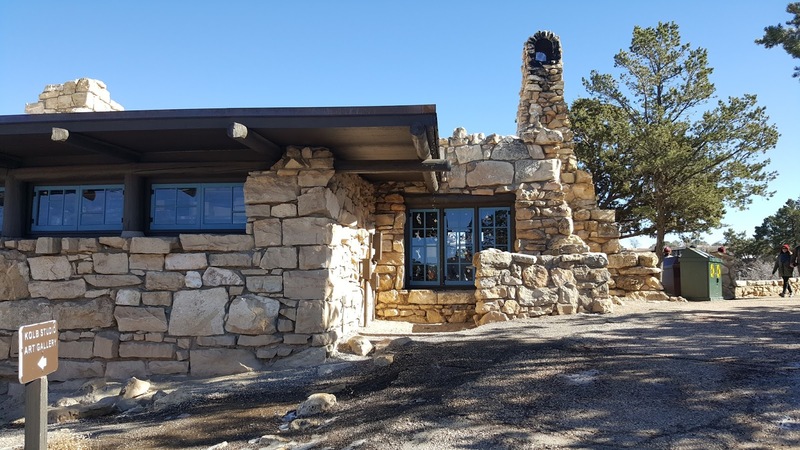 Now, there will be an occasion where we are both needed to work a full 9, or 10 hour shift as we are still short on cashiers, but within a couple of weeks we will be hiring more cashiers. For a Saturday it was slower than normal....I didn't process my first customer until 10:12 am. My total cash deposit after 4.5 hours of work was $14.74.....TLE reported she dropped around $300 so the afternoon picked up at lot. 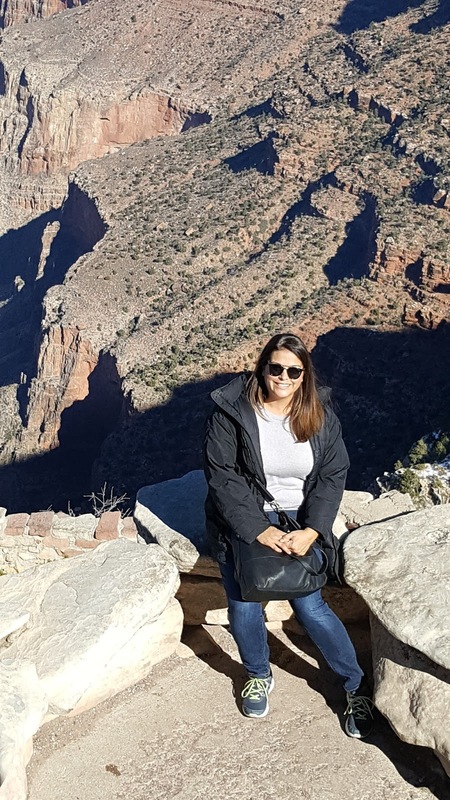 Our daughter, Meredith, decided to drive out of the park through Desert View so she stopped by the General Store around noon time, just as I was pulling my cash drawer, to say her 'until next times', and since she was there she gave me a ride home. My first thought after getting home was "I need a nap", so that is what I did.....take a nap. In fact I napped most of the afternoon. We had spent the prior night at Meredith's hotel in her room, which was a very nice suite with a separate bedroom, and two baths, but the hideabed couch was TERRIBLE, and as a result neither of us got a very good night's sleep, hence the need for a long nap Saturday. TLE was home by 5:30......another day spent in paradise.....thanks for stopping by! 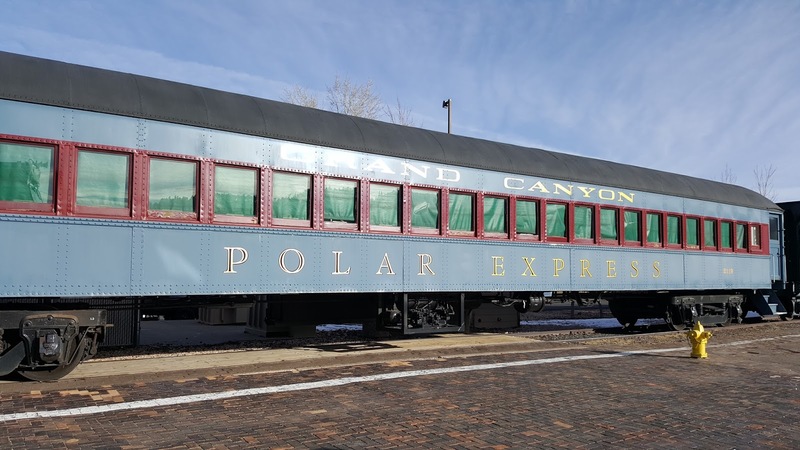 5:46 am - Saturday - January 27th - Grand Canyon - 24º F, 40% humidity, wind 4 mph out of the northeast......forecast high for today is 45º F with sunny skies....we're in a warming trend....by Monday we will have 12 days of temp in the 50's again. 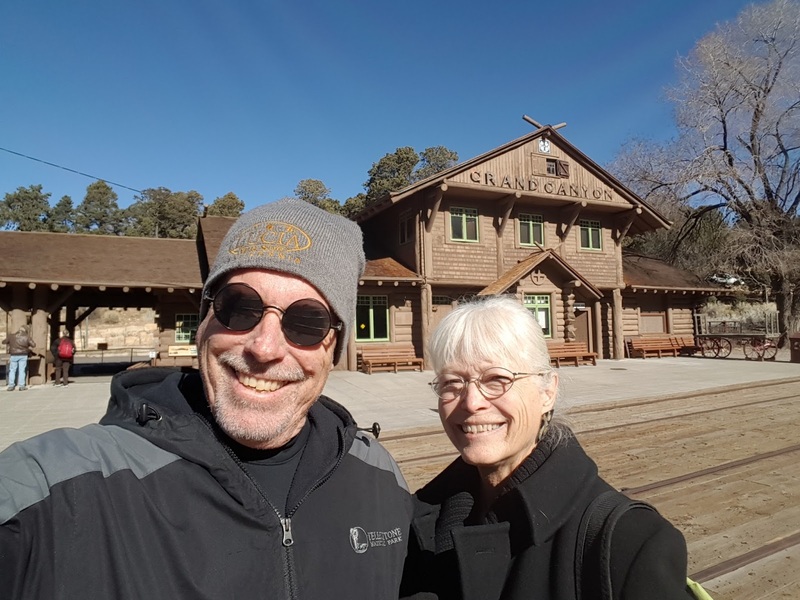 We had originally planned to do some hiking with our daughter Meredith on Friday, but she had arrived at the Grand Canyon congested, so we opted for a more sedate activity on Friday.....ride the Grand Canyon Railway! 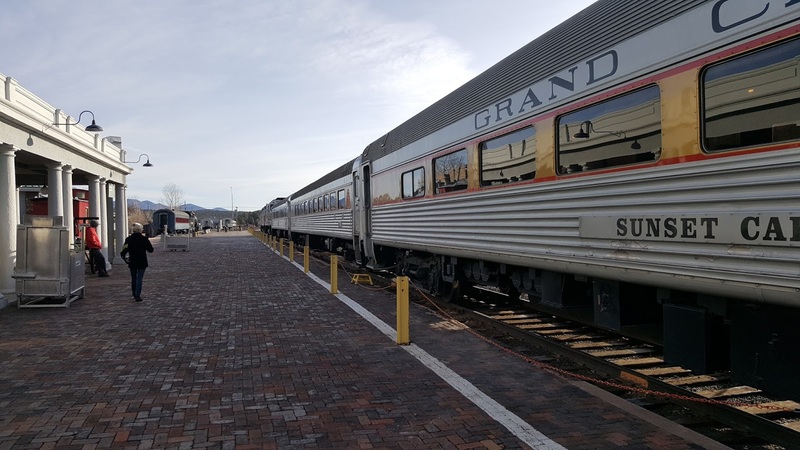 We were up by 6 am Friday as we needed to be on the road driving to Williams, AZ where the Grand Canyon Railway originates. 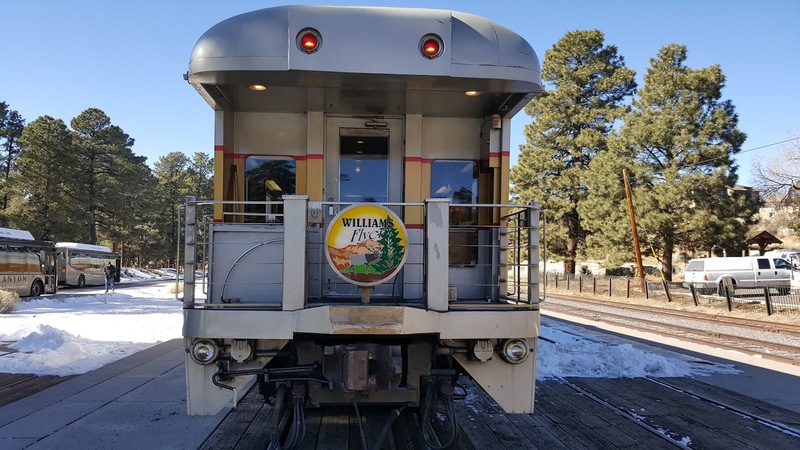 During the winter they run one train which leaves Williams at 9:30 am arriving at the El Tovar Hotel by 11:45 am. 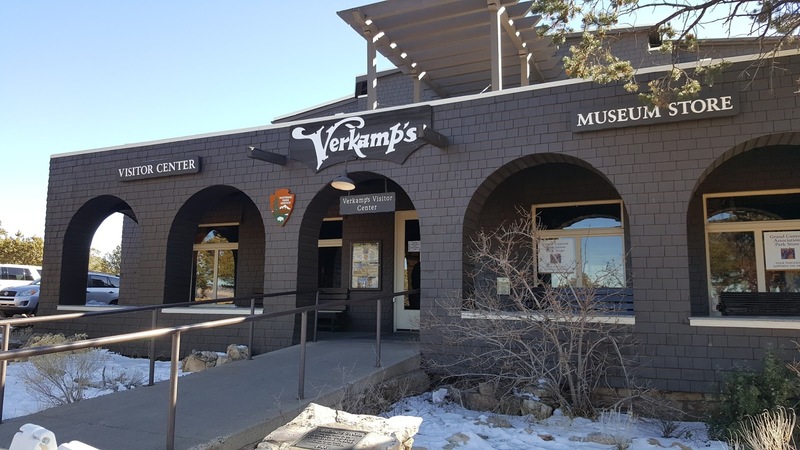 We ended up leaving Tusayan from Meredith's hotel around 7:45 am, and arrived in Williams by 8:35 am. We quickly found a small cafe where we ordered some coffee and pastry to hold us over until lunch. .....regrettably the food did not live up to the excellent ambiance and above average service. It wasn't terrible, it just wasn't that exceptional.......however, the draft beer was excellent! .....the train left right on time, and within 15 minutes we were in the 'Cafe Car' enjoying a glass of wine, and talking about our day. 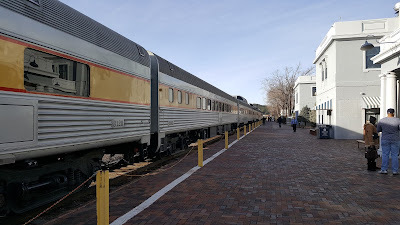 The train, again, arrived in Williams a little earlier than the advertised 5:45 pm, and we were in Meredith's car driving back to Tusayan by 6 pm. 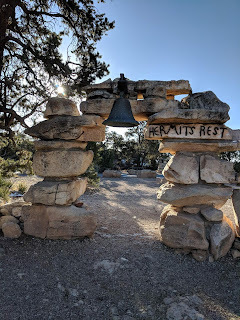 We were all tired after our day of adventure, so when we arrived back at Meredith's hotel about 6:50 pm we quickly bid her adieu, got in our car and were back at Desert View by 7:30 pm. 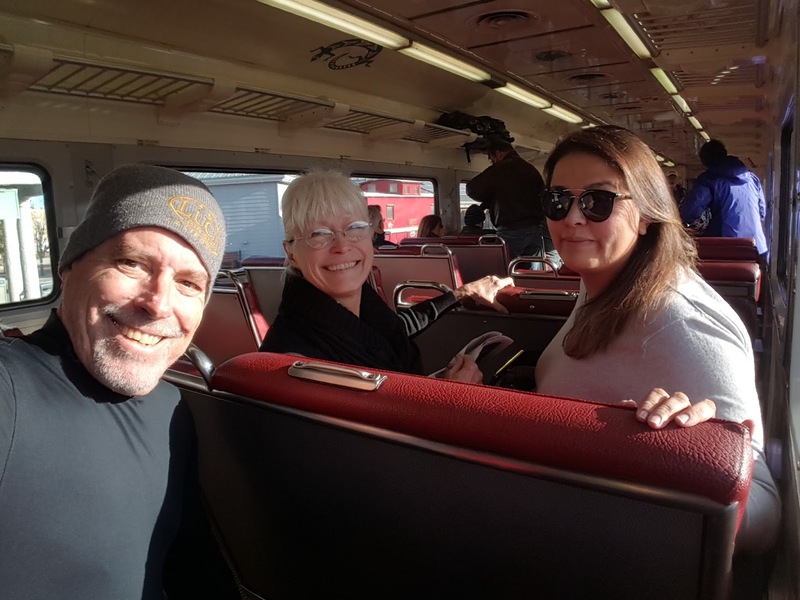 We will see Meredith again on Saturday afternoon as she makes here way back to Phoenix, AZ for her 9 pm flight back to SoCal. Well, we've checked off another bucket list item.....ride the Grand Canyon Railway. It was a thoroughly enjoyable experience, and well worth the price of admission. We would highly recommend it to anyone! 6:23 am - Friday - January 26th - Grand Canyon - 24 degrees F, 58% humidity, wind - CALM.....forecast is for clear skies with a high of 42 degrees F.
.....we made it in time for the 5:30 pm showing (it runs every 60 minutes beginning at 9:30 am each day with the last showing at 6:30 pm. We had decided to spend the night with Meredith at her hotel (she had a suite with a separate bedroom, and two bathrooms, plus a hideabed). We arrived there a little after 6 pm and began consuming the pizza we had just bought.....there was a little Bulleit Bourbon on the side. It was a perfect day, which just kind of evolved. 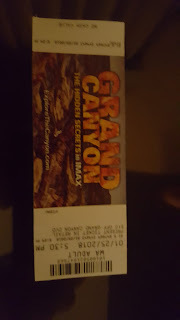 At some point in the afternoon we decided we would purchase tickets to ride the Grand Canyon Railway on Friday. We will drive down to Wiliams, AZ where the train originates, and take the trip up the the Grand Canyon where we will spend 4 hours, then take the return trip to Williams at 3:30 pm arriving back in Williams around 5:45 pm.......so looking forward to that! 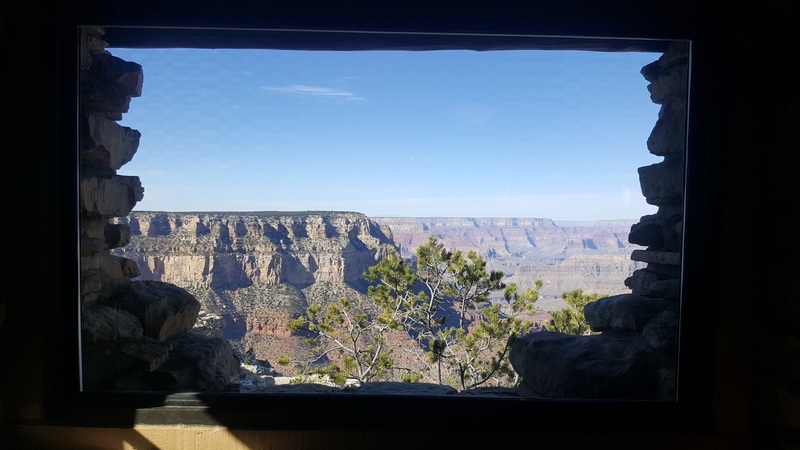 7:47 am - Thursday - January 25th - Grand Canyon - 33º F, 29% humidity, wind 5 mph out of the south.....forecast is partly cloudy with a high of 51º F. I could hear the wind blowing all night long, and as I write it is still blustery. 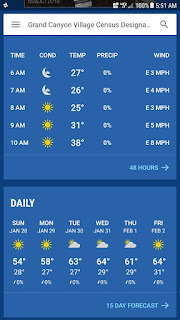 The forecast for today also includes winds in the 20-30 mph range.....should be an interesting day. Wednesday was our second full day shift in as many days......I worked the 'open/close' shift (10 hours) at the General Store and TLE worked the 'open/close' shift (9 hours) at the Trading Post. The day began as most do here at Desert View in late January.....very slow. By the time I finished opening the store, dry mopping the entire retail store, then wet mopping the same floor it was after 9 am and I had not had a customer. Finally at 9:30 I had my first customer, but by 11:30 I had only had 3 customers. Then the roof fell in......over the last 5 hours of my shift I did almost $500 in cash sales, with many of them coming in the last hour......we closed the doors at 5 pm, but the last customer did not pass through the checkout lane until 5:10 pm. Our manager, Dakota, was there at the end running the second register to help process all the customers, otherwise it would have been 5:30 before we cleared the store. Around noon time my oldest daughter, Meredith, arrived at the General Store after driving over from her hotel in Tusayan. There is still a lot of ice from our last storm on the road that connects us with South Rim Village, so it was slow going for her in some sections. 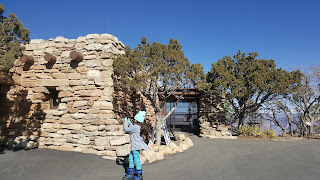 We talked for a while before she walked down to see her mother at the Trading Post, then paid an obligatory visit to the Watchtower before heading back to Tusayan. We will be off Thursday and Friday and be spending both days with her giving her a tour of our favorite places. 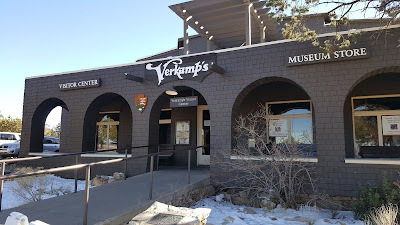 Around 5:30 pm TLE I clocked out of the General Store and drove over to the South Rim Village to meet Meredith for dinner at the Yavapai Tavern. On our drive over we got to see first hand how icy the road is....there are probably about 8 miles where you can only drive about 25-30 mph. We had a delightful dinner with Meredith....we all had the BLT, which is my favorite, and spent the entire time moving from one topic to another. We always thoroughly enjoy our time with Meredith, and are so looking forward to Thursday and Friday. Our drive back home to Desert View took a little over 40 minutes due to the ice, but we arrived home around 8:15 pm. I was totally drained after 10 hours of work and then the drive to and from the South Rim Village. Looking forward to a more relaxed time the next two days! 5:38 am - Wednesday - January 24th - Grand Canyon - 23º F, humidity 49%, wind 5 mph out of the east by southeast......forecast if for sunny skies with a high of 49º F.
......my shift there was a 9 hour shift (8:30 am to 5:30 pm) with a 30 minute off the clock lunch. As is the case with the General Store, business was quite slow most of the day. I ended up depositing around $214 in cash. Most of the items in this store sell at a much higher cost, and it doesn't take many sales to break $200, so you get the picture. When I took my 30 minute lunch break around noon time I walked up the General Store and sat at a table in the Deli to eat a sandwich and talk with TLE, which was nice....it's been a couple of months since we had lunch together on a work day. 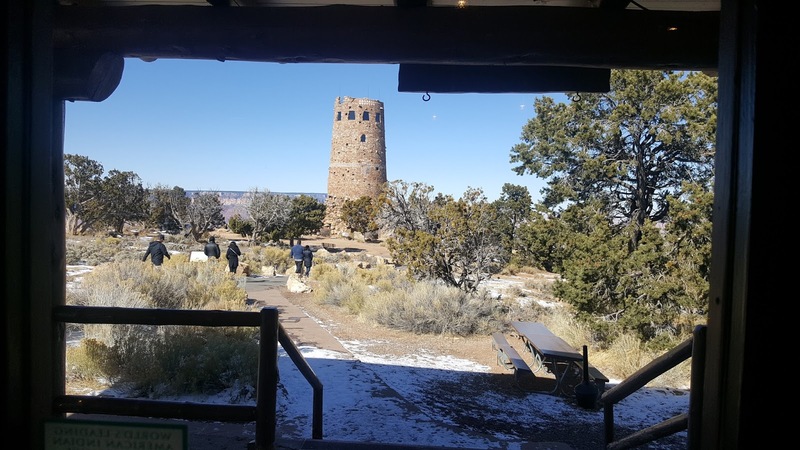 I actually enjoyed the change in routine and the new view out the windows.....I went to the windows several times an hour to see the Watchtower and the Grand Canyon. I also spent time reading a book when there were no customers in the store, which was most of the morning and afternoon. 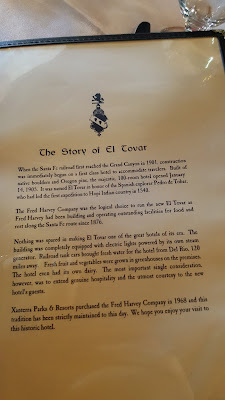 Nevertheless, the time seemed to pass quickly and by 5:12 pm I had counted down my cash drawer and was walking up to the General Store where TLE had just finished working a 10 hour shift. It is not often, in fact very rare, that TLE and I go home at the same time, and that was kind of nice, too. For dinner TLE heated up an enchilada casserole she had made a couple of days before.....yum! Her enchilada casseroles always taste the best after a couple days aging in the refrigerator. Again I say, I am a lucky guy! Wednesday TLE and I will flip locations with her working a 9 hour shift at the Trading Post, and me back at the General Store for a 10 hour shift. We'll be off Thursday and Friday and spending time with our oldest daughter, Meredith! 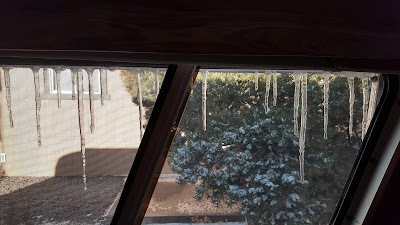 6:33 am - Tuesday - January 23rd - Grand Canyon - 26º F, 38% humidity, wind - 6 mph out of the east......forecast is for sunny skies with a high of 40º F. No water freezing these past few days so the heat tape I put on the hose bibs is working! The big news to come out of Monday is that the government shutdown is over......for two, or three more weeks. The Republicans and Democrats voted to end the filibuster 88-18 paving the way for the temporary 3 week budget to be passed, or at least that's what I heard at first. Later I read somewhere that our next shutdown deadline is February 8th, so I guess its just a two week extension. We are all wondering what changed between Friday night and Monday afternoon that ended the shutdown.....as far as I can tell from reading numerous sources nothing changed at all, except maybe the Democrats were losing in the court of public opinion. The bill that was passed Monday was exactly the same spending bill that was filibustered by the Democrats on Friday. The other good news is that except for the erroneous meeting we had on Saturday, things continued on here at the Grand Canyon as if nothing had happened. 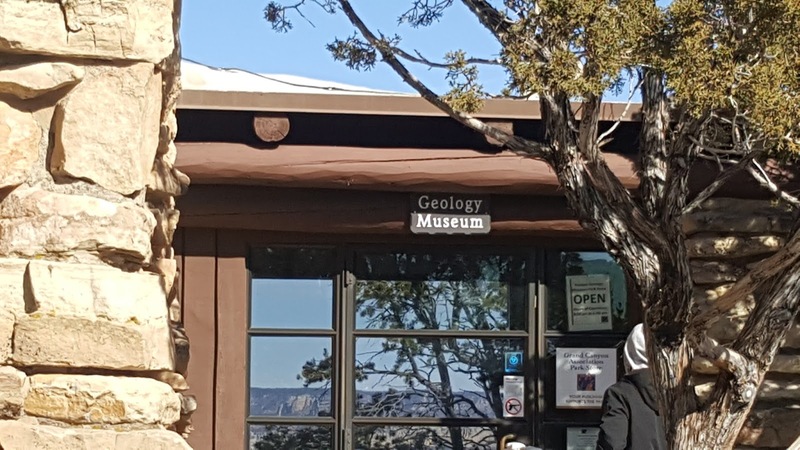 The only real change was that there were no NPS folks staffing the entrance kiosks so if you were visiting the Grand Canyon you got in for free Saturday, Sunday and Monday....that's actually pretty cool. At any rate, Monday was a normal unbusy day. I had the 'open' shift and my first customer did not come to the register until 9:30 am. My next customer was at 10:30 am. By the time I counted down my cash drawer I had processed about 10 customers for my shift and deposited about $89. The Deli did not get their first customer until after 12:30 pm. The snow is slowly melting, and I mean SLOWLY, and there is still a lot of ice on sidewalks and streets. 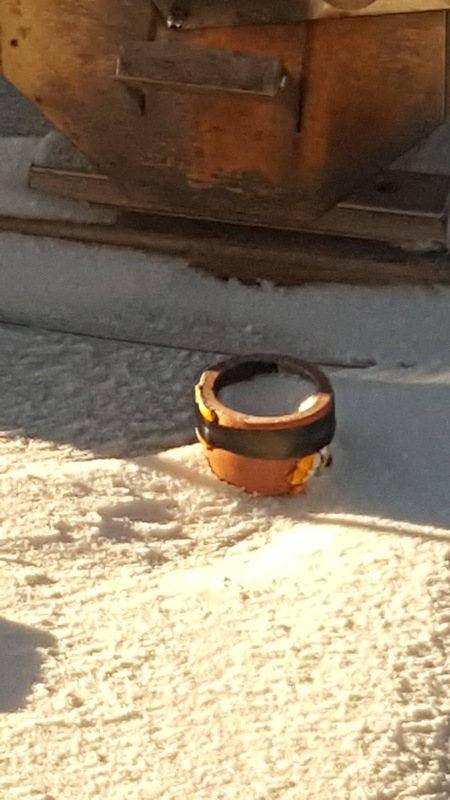 It's been so cold these past few days that in some places the snow has not melted at all. A good example of this is the drivers side of the Newell which remains in the shade all day long....the snow is still 2-3 inches deep there, and to dump our black tank, which I did Monday, meant I could not wear my slippers, which I usually do, but had to put on shoes and socks. With the temps getting back into the mid 40's over the next few days I expect the snow melt to accelerate. 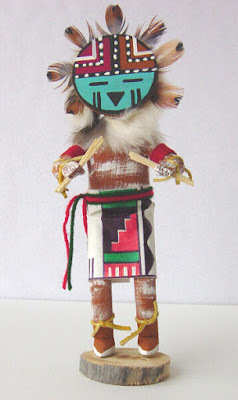 TLE and I both have long shifts Tuesday and Wednesday.....I work at the Trading Post (first time) for a 9 hour shift, and then back at the General Store Wednesday for a 10 hour shift....TLE has the flip side of that. 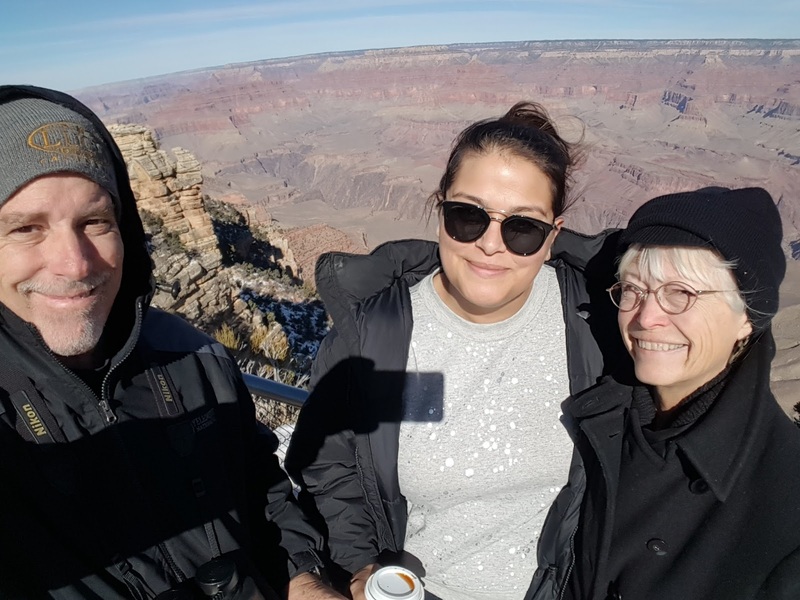 Then we are off for Thursday and Friday to give our daughter, Meredith, the nickel tour of the Grand Canyon....really looking forward to that! 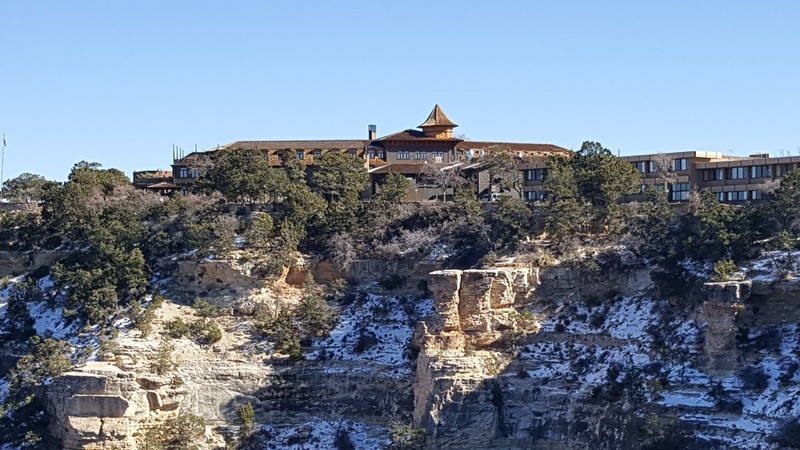 5:56 am - Monday - January 22nd - Grand Canyon - 5º F (feels like -2º F), humidity 71%, wind - CALM......forecast high for today is 37º F with partly cloudy skies.....BP 125/77. We slept in til after 8 am thinking we did not have to go to work, but about 10 am there was a knock on the door. It was our assistant manager there to advise that the meeting we had the prior morning in which we were told, in no uncertain terms, that our store would remain closed for the duration of the government shutdown was a complete misrepresentation of the actual facts. 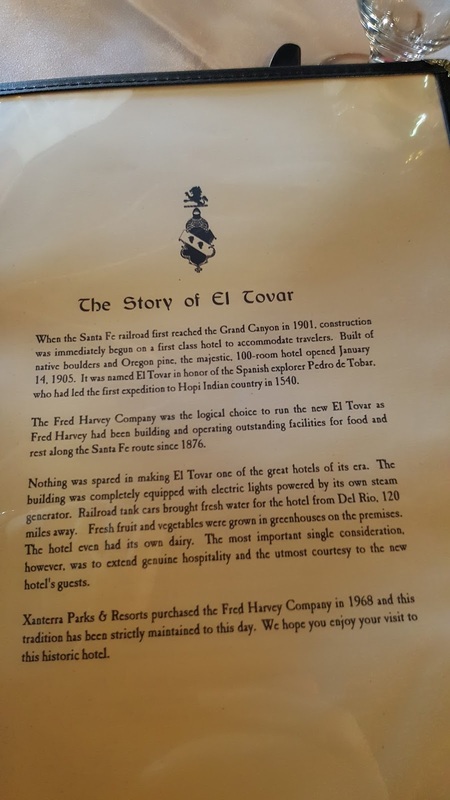 The manager, apparently, had completely misreported the information from the compay meeting he attended on Friday. 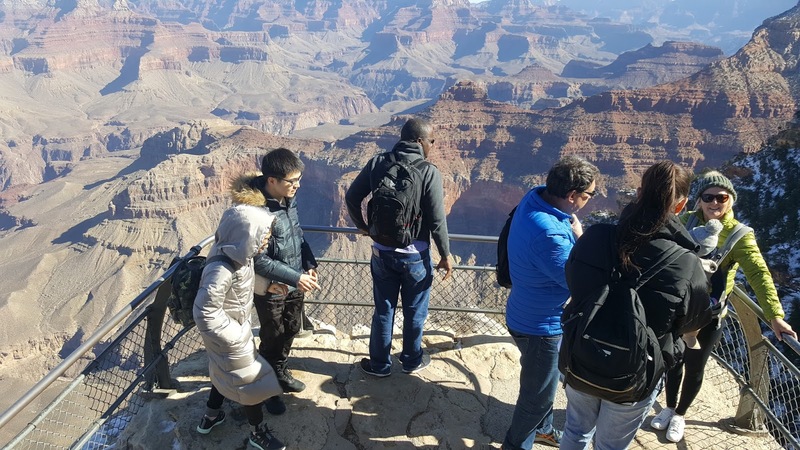 How it is possible to completely misunderstand what was being said in a meeting held expressly for the purpose of discussing the government shutdown and its ramifications for the Grand Canyon operations I have no idea. 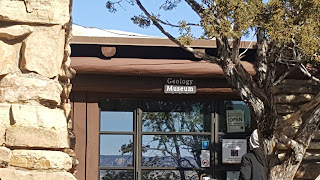 As it turns out our store should have been OPEN, not CLOSED on Saturday......the government shutdown was having NO effect on operations at the Grand Canyon......it was business as usual.....the gates were not closed, the roads were plowed, and everything was like a normal weekend.....all NPS employees were working......nothing, not one single thing, we were told was correct. At any rate the assistant manager (in no way at fault for what had happened) was there to tell me I needed to report for work at my earliest convenience as some of our employees (lucky them) had left Desert View immediately after the completely unnecessary, bogus Saturday morning meeting to go visit family, etc. To say I was a little out of sorts about this news is an understatement. To be fair, I was scheduled to work on Sunday before the government shutdown happened at 12:30 pm. After getting myself together I walked through the snow over to work arriving just before 11 am to a store devoid of customers. If I was the manager and I had made such an amazing, bonehead goof I would have let everyone still at Desert View know that I had given them incorrect information, to be prepared to work Monday, and then had all the managers and supervisors run the two stores on a very unbusy Sunday, but our manager was no where to be found, or heard from. I'm sure he must be a little embarrassed....I'm sure I would have been. What would you have done in such a situation? Okay, enough of my rant......from the time the store officially opened at 10 am (2 hours late) until the store closed at 5 pm the total cash sales were $179.56.....the Deli was not even that busy. As an attempt to apologize for the debacle, and us having to work Sunday our assistant manager, Wayne, bought us all a meal......I ordered the French Dip and took it home for dinner. One clarification is in order.....it is possible that our manager was not the one who goofed up....it may have been someone above him, but we don't know, because our manager has not been heard from. I do know that the Marketplace store, also run by Delaware North, was open, so they apparently weren't given bogus information. 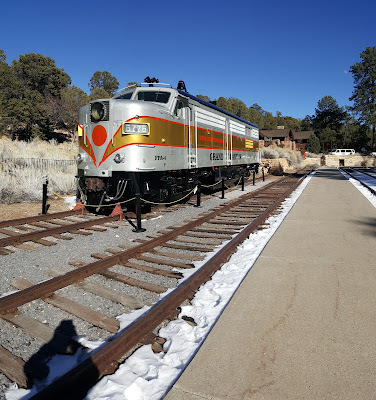 That was my Sunday, and in a few minutes I will be trundling off to work for the 'open' shift on a day when I thought I would be on my way to Prescott, AZ for an overnight trip....sigh....thanks for stopping by! 8:28 am - Sunday - January 21st - Grand Canyon - 18º F (feels like 8º), humidity 71%, wind 7 mph out of the west by northwest......mostly clear skies with a forecast high of 33º F. Very cold last night, but our water did not freeze! We were awakened Saturday morning about 7:30 am by a knock on our door....it was our assistant manager, Wayne, advising we had a meeting to discuss the government shutdown at the General Store at 8 am.....uuggghhh.......not the way I wish to awake. Thirty minutes later we were getting in the car to drive over to the store as it began to snow in earnest. By the time we finished our ever so brief meeting (frankly everything we were told could have been sent in a simple two sentence text, but you know how the corporate world loves face to face meetings) the snow was already sticking. Essentially we were advised that our store would be closed for the duration of the government shutdown (the Marketplace over at the South Rim Village will remain open). Of course, there will be no snow plowing as the NPS folk handle that. This is supposed to be a 'soft shutdown' according to everything I have read, which means that while there will be no NPS (National Park Service) employees on duty, the gates will remain open and the public will be allowed to enter for free to site see, and even hike.....we'll see....I hope so. 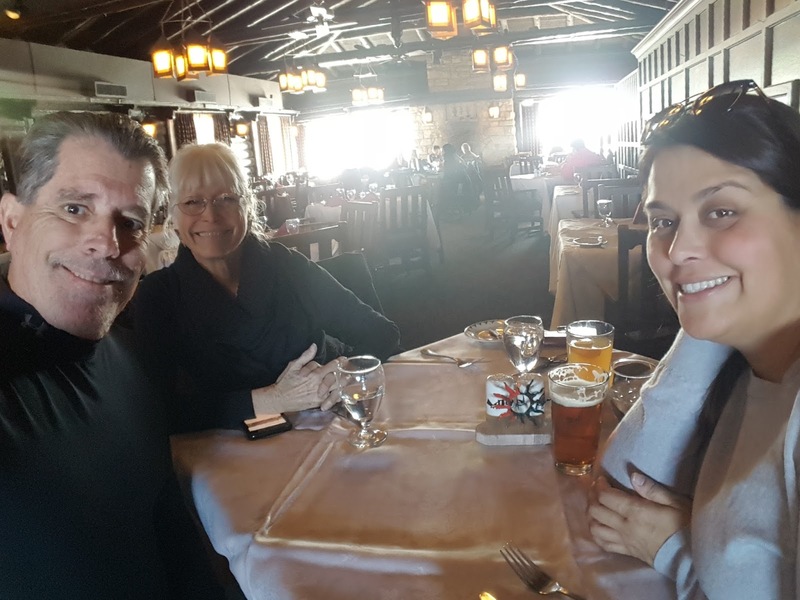 As we drove home we talked about what we might do during our forced 'vacation'......our daughter was already scheduled to arrived Tuesday evening to spend three days with us. She is staying in a hotel over in Tusayan, so we hope the gates will remain open allowing us to drive just the 25 miles over to Tusayan instead of the 135 one way miles (south to Flagstaff, and up to Tusayan). Either way we will be able to spend time with her. 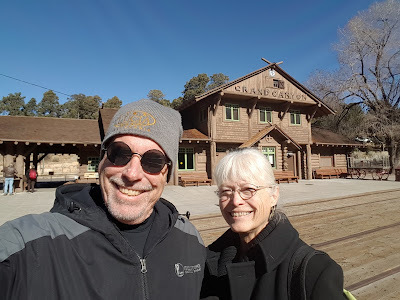 On Monday we plan to drive down to Prescott, AZ to shop at the Costco, Trader Joe's and Verizon store, spend the night, and then return to the Grand Canyon on Tuesday. 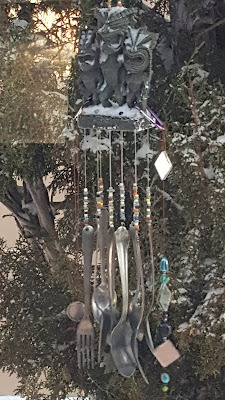 8:38 am - Saturday - January 20th - Grand Canyon - 33º F, humdity 78%, wind 11 mph out of the southwest.....it is snowing right now.....started about 8 am mountain time and is supposed to continue on and off all day. 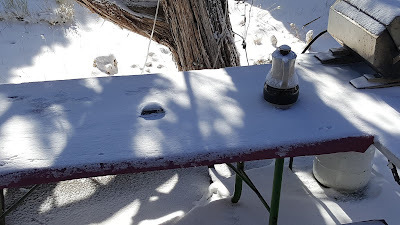 Forecast is for 1-3 inches of snow accumulation and a high of 34º F, so we are close the the high for the day right now at 8:48 am mountain time. The big topic of conversation around Desert View all day Friday was 'will the government shutdown? ', and what will be the ramifications of that. I had the 'open' shift and that was the first thing our assistant manager, Wayne, talked about when I walked through the rear door at 7:25 am. What would the shutdown look like? 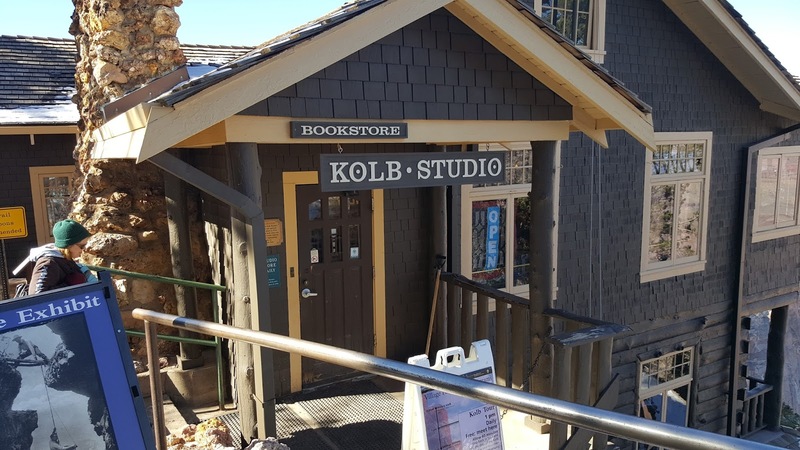 Will the store stay open, or will it close? Will the gate just a few feet west of the Desert View entrance be closed, or will it be left open? If the gate is shut we can't get to the main village, or the Marketplace, but we would be able to exit the park at the east gate which is about 1/4 mile from our location, and drive into Cameron, or Flagstaff for supplies. Frankly, our hope was for a shutdown that included our store as it is time for a short vacation. As is almost always the case my 'open' shift flew by and there was TLE bringing her cash drawer out at 12 pm. Our internet connection was being erratic and I was not able to process credit cards, so I was glad I was off, and it was going to be TLE's problem. She later reported that the internet was very slow all day, however she deposited over $350 in cash....I deposited $87, because I was doing all cash. I didn't have my first customer until 10:30 am. Had my credit card processor been working I might not have taken in any cash. TLE needed some more cough syrup (Delsium, which we don't carry at Desert View), so I drove over to the Marketplace right after I got off work to pick up that and some bread and grapes. My friend Art Young was working and so we spent about 30 minutes chatting and catching up on each other's lives. It's easy for Art to keep up with me as he reads my blog.....😊 It's always good to see and talk with Art! I was back home before 2:30 and spent the rest of the afternoon reading....the wind was quite blustery, and it was very cold outside, so being inside was definitely my preference. I read and napped until it was time to drive back over to pick up TLE at 5 pm......she was out the back door by 5:20 pm and we were on our way home. We watched a few recorded programs and then tuned into Fox News at 10 pm (midnight Washington D.C. time) to see if the government was shutting down....the answer was 'YES'. Around 2 am in the morning we got a text from our manager, Dakota, that we had a meeting at the store at 8 am Saturday morning to discuss the ramifications of the SHUTDOWN. 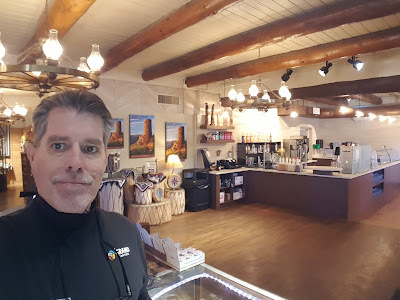 9:13 am - Saturday - We just returned from the store meeting, and we (the General Store) are also shutdown until further notice, so now we have to decide what we are going to do......more on that tomorrow (Sunday) morning. 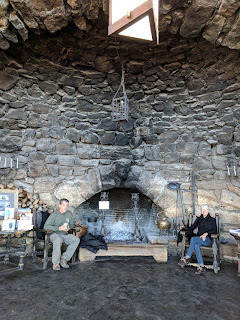 Our daughter, Meredith, is coming to visit us Tuesday, and was planning on staying at a hotel in Tusayan, which is just outside the west gate. 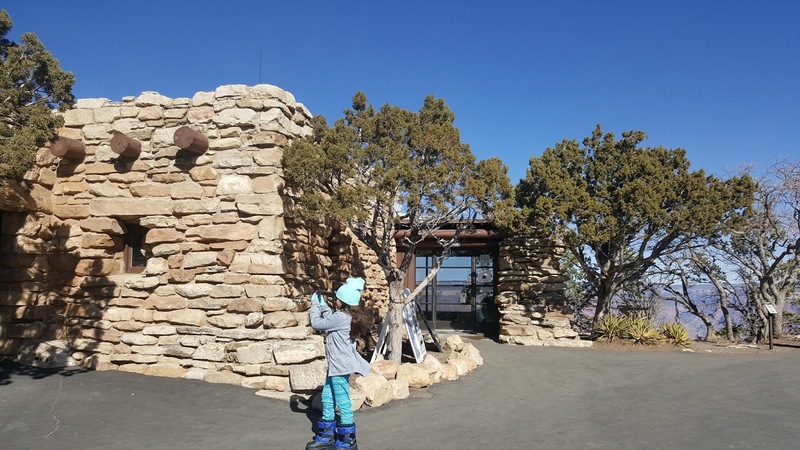 If the government shuts the gates she will have a long drive (about 150 miles) around to come and see us instead of the 25 miles between Desert View and Tusayan. Desert View - Day 70 - SLOW!! 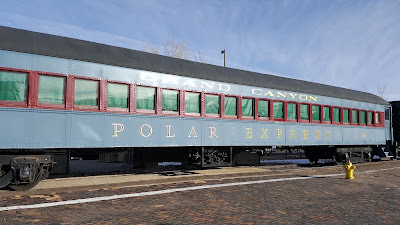 5:54 am - Friday - January 19th - Grand Canyon - 33º F, humidity 50%, wind 3 mph out of the south by southwest....partly cloudy with a forecast high of 56º F....it only gets colder from here....snow on the way tomorrow morning! Wow.....big milestone....70 days at the Grand Canyon as of Thursday.....71 today, Friday. Ahhhhh, my next to last 'close' shift. Beginning Monday I will have all 'open' shifts, and TLE will take all the 'close' shifts. Due to the one 10 hour day on Wednesday I closed three consecutive days. I'm looking forward to the change....just one more 'close' on Sunday and I'll have my afternoons back! 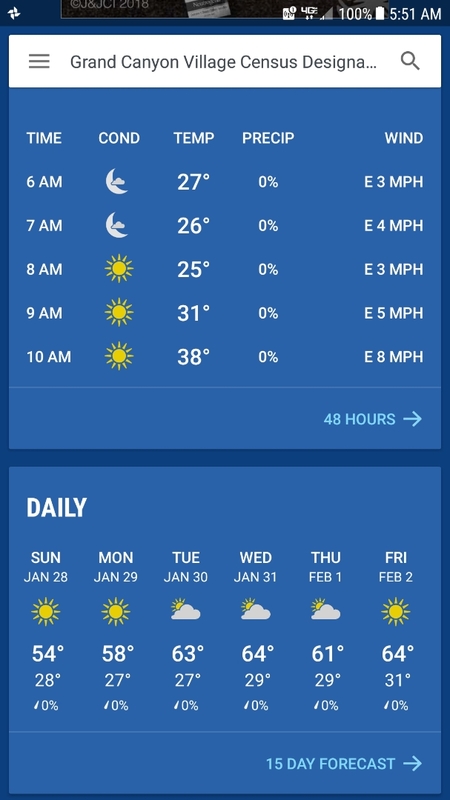 The overnight temps have only been getting into the low 30's lately and we have been sleeping most nights without a heater. Since our 'fireplace' in the salon has a remote control I take it, the remote, to bed with me, and only turn the fireplace on when it gets 60º F in the bedroom. When we dry camped last winter out near Borrego Springs the inside temp often got into the mid 40's, but we were sleeping in back then, so we didn't care. Since one of us is almost always up at 5:30 on days we work it's nice not to have it get too cold as it takes a while to warm things up when the heaters have been off all night. I reported to work at my usual 11:55 am, clocked in, and was at my station shortly thereafter. TLE reported it had been a very quiet morning.....she banked just over $60 for her 'open' shift. It was not much better for me....I ended up banking $174 and change. When there is not much to do, and very few customers the clock seems to run backwards. There is only so much one can do around the store absent any projects, of which there were none this day. 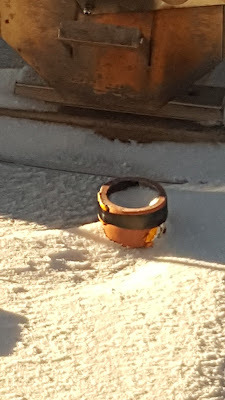 A couple of days ago I spent about 90 minutes cleaning the lenses of all our sunglasses.....probably about a hundred pair......after a summer and fall of being handled by customers they had a lot of fingerprints on them. After a week, or two of dwindling customer traffic there are not many projects like that left. We had one customer in the last 45 minutes of my shift so I was able to get all my 'close' duties (vacuum the throw rugs, record the temps of all the coolers and freezers, turn off the cooler lights, flip the 'OPEN' sign to 'CLOSED', etc.) completed before 5 pm, had my cash drawer counted down by 5:17 pm, and was on my way walking home by 5:20. The sun is going down now about 5:41 pm now so it is much lighter on my walks home.....sunrise is still after 7:30 (7:36 am), so it is still semi dark when I leave for work at 7:15 am.....looking forward to when the sun is up before I go to work. It moves up about 1 minute per day. We watched a recorded episode of 'The Amazing Race' and were in bed by 9:30 pm.....thanks for stopping by! Desert View - Day 68 - No Winter? Desert View - Day 65 - Pay attention! Desert View - Day 58 - WOW! 2017 In Review - Part One.....What a year! Desert View - Day 55 - Mice? Desert View - Day 53 - Happy New Year!